This article was written by Sparsh Mehra, a student of the W.B. National University of Juridical Sciences, Kolkata. The most controversial principles in international law are self determination. When this principal was started it was just a political principle but gradually became the principle of international law. In this paper I will discuss the History of self determination. Self determination is a core principle under the international law and is recognized as under “general principle of law” and cherished in various “international treaties”. The meaning of self determination will also be discussed in this paper. Then the self determination in Kosovo and Kosovo and Palestine will be compared. The concept of self-determination originated when the Independence of the United States of America on 4 July 1776 was declared. Under this it was declared that government inferred ‘their equitable forces from the assent of the represented’ and that ‘at whatever point any Form of Government gets to be damaging of these finishes, it is the Right of the People to modify or to abolish it’. Self-determination was followed by the French leaders. During the nineteenth century and the start of the twentieth century the guideline of self-determination had been interpreted by patriot developments as implying that every country had the privilege to constitute a free State and that lone broadly homogeneous States were honest to goodness. The rule of self determination was likewise conspicuous in the unification procedures of Germany and Italy, which to an expansive degree depended on national qualities in which plebiscites had essential impact. Self-determination further developed when it was embraced by the socialist development and the Bolshevik revolution. It is well defined and created by Lenin and Stalin, the principle of self-determination was spoken to as one of international law. It ought to, in any case, be said that the privilege of self-assurance in Soviet precept existed just for situations where it served the reason for class conflicts thus called socialist justice. It was just a strategic intends to serve the points of world socialism and not an end in itself. When the World War 1 was going on President of United States, Wilson came up with the principle of Self Determination. The proposal for the Self Determination was fully realised in the Paris peace treaties. However, it was held in the number of disputes areas. That it is which were included under the league Nations for the protection of minorities was included in it. The promotion of self-determination was one of the major goals of United Nations after the World War II. There were two meanings which were stated by the United Nations charter. The first one was that a state has right to form any political, economic, social and cultural system. And the second one is that people have their own right to choose whatever the situation they want to choose within an existing state. “Though the principle of self-determination of peoples plays an important part in modern political thought, especially since the Great War, it must be pointed out that there is no mention of it in the covenant of the League of Nations. The recognition of this principle in a certain number of international treaties cannot be considered as sufficient to put it upon the same footing as a positive rule of the Law of Nations”. “A principle of justice and of liberty, expressed by a vague and general formula which has given rise to the most varied interpretations and differences of opinion”. There is only 2 times when the principle of self- determination is mentioned in the charter of United Nations that also in the context of developing friendly relations among the Nations and in the principle of equal rights of people and their rights to dispose of themselves. Under this, the reference of people means that the group which belong to the states and includes the non governing territories. With the progress of decolonization the principle of self-determination evolved into the right to self determination. This evaluation was done between the year 1960 and 1970 when the majority of former colonies became independent. Declaration on granting of Independence to colonial countries and people was adopted by UN General Assembly 1960. The legal right of people through which their own destiny is chosen in the international order is signified under International law. Self determination is a core principle under the international law and is recognized as under “general principle of law” and cherished in various “international treaties”. Self-determination is protected by the “united nations charter as well as international covenant on civil and political rights”. It has two aspects which are internal and external. Under internal self determination, the people of the state get the right to govern themselves without the outside interference. Where as in external self determination, the people has the right to determine their own political status which includes the formation of their own Independent state. The degree and reason for the rule of self-assurance has developed fundamentally in the twentieth century. In the mid 1900’s, international support developed for the privilege surprisingly to self-assurance. Successful movement were formed after WWI, WWII and laid the basis for decolonization in the 1960s. The difference between “internal” and “external” self-determination is done by Contemporary notions. Internal self-determination may refer to different types of political and social rights; by contrast, external self-determination refers to full lawful freedom for the given individuals from the bigger politico-legitimate state. The principle of self-determination is to bind upon the parties, whether it has been adopted on the basis or as rule for the settlement of a specific issue or dispute. The principle of self-determination was chosen as a basis for negotiation n the peace treaties after World War I, and in the cases of Kashmir (after 1948), Algeria’s struggle for independence and the Saar Territory (1955) and Algeria’s struggle for independence. Self- determination is the effect of the act of the UN under Chapters XI to XIII UN Charter. It has clearly been emerged unmistakably developed as the legal foundation of the law of decolonisation. As explicitly asserted by the ICJ both in Legal Consequences for States of the Continued Presence of South Africa in Namibia despite Security Council Resolution and in Western Sahara (1975), it got to be applicable to non-self-representing territories, trust territories and mandates, despite the distinctions and the capabilities of the separate constituent instruments Western Sahara. The external self-determination is taken into account on the basis of extinction of the bigger state. This principle was proposed with regards to the southern Balkan wars in the first half of the 1990s. It was imagined by that the European states that the position state of the SFRY had stopped to exist, and that its constituent components in this manner had a privilege to external self-determination. The general perspective was that for these reasons the Republics were the constituent parts. So Serbia, including Kosovo, was the outer self determination ‘unit’, and in the end it wound up as a free state. The Albanians in Kosovo had contended that the high level of self-sufficiency Kosovo had been given inside the Serb Republic under the old SFRY made it a Republic in everything except name, and that, in like manner, the area ought to have been dealt with as an outside self-assurance unit in the mid 1990s. States did not offer general backing to this position, in any case, and the circumstance of Kosovo was not tended to in the Dayton Agreements in 1995. The issue which international law is facing these days related to separation of the SFRY is that the events taking place in the early 1990s. Under this four of the six Republics of the government state declared independence. “This could have been regarded either as a set of unilateral secessions without the consent of the ‘parent’ state, in which case they would not have been in conformity with international law, or as events that merely precipitated the extinction of the larger state, in which case there was no state from which to break away, with each component thereby enjoying a right of self-determination”. After 1999, Kosovo was no longer under any control by Serb authorities. The official presence of UNMIK and KFOR were removed which is now known as Serbia. The term protectorate in international law indicates a circumstance where a territorial substance is liable to some type of managerial control by foreign actor who does not itself appreciate title over the territory, where this control is of an importance in order to put the political and legitimate feasibility of the element into inquiry, remembering the freedom and viability criteria of legal statehood. The term protected state indicates a substance which is a state in spite of the presence of insurance. A case would be Bosnia and Herzegovina, which is a state in spite of outside military nearness and the regulatory part of the Office of the High Representative (OHR), in light of the fact that, seemingly, of the mind-boggling worldwide responsibility, through acknowledgment and UN participation, to its satisfaction in this status. “The parties were unable to reach an agreement on the final status of Kosovo. Neither party was willing to cede its position on the fundamental question of sovereignty over Kosovo”. The parliament of Kosovo on February 17th passed a statement declaring Kosovo an independent and sovereign state. On February 18, US Secretary recognised Kosovo as a sovereign and independent state. France, Germany, UK and other European Union members also have a recognised Kosovo an independent sovereign state. “It cannot seriously be argued today that international law prohibits secession. It cannot seriously be denied that international law permits secession. There is a privilege of secession recognized in international law and the law imposes no duty on any people not to secede”. The main focus of it should be on whether the Kosovo meets the criteria for legal privilege of secession or not. As stated above there are two distinct subsidiary parts under the self determination. Internal self determination is essentially responsible for the protection of minority rights within the state. Under internal self-determination the state should provide minority to speak their own language practice their own culture and participate in the political community. Kosovo’s unilateral declaration of independence has generated various reactions between Israeli and Palestinian critiques that indicated their anxieties about their corresponding situations. An editorial in the Israeli daily Haaretz called on the Israeli government to immediately acknowledge and recognize Kosovo, arguing that “the struggle of the persecuted Kosovar people for independence is reminiscent of the struggles by other nations for the right of self-determination”. Of course Haaretz was not talking about the Palestinians, but about the “State of Israel, which was set up in the wake of the Jewish people’s struggle for their recognition”. By identifying Israel with the supposed underdog, ethnic Albanians in Kosovo, Haaretz implicitly recognizes that there are indeed some striking similarities though not ones it would acknowledge. Kosovo, like Israel, was illegally severed by force of arms from another country against the wishes of the majority population of the whole territory. Both entities came into being and can only survive with the sponsorship and support of the Great Powers of the day who sustain them in violation of international law because it suits their imperial interests. Furthermore, both entities are animated by a virulent ethno-nationalism that is fundamentally incompatible with the values of freedom, tolerance and democracy that they claim to have come into being to uphold. In this way, Kosovo is the latest country in a collection of Western-backed pseudo-states that also includes the Kurdish entity in northern Iraq. Haaretz’s desire to acknowledge Kosovo flows not just from altruistic concern for the deprived, but is also explicitly opportunistic. Firstly, doing this would appease Washington (Israel’s main sponsor), and secondly it provides a “unique opportunity” to “prove that Muslims are not oppressed by Jewish state” — though Haaretz was careful to note that Albanians in Kosovo are ‘good’ Muslims “who have not identified with extremist Islamic tendencies and have kept a distance from Israel’s opponents in the Arab world”. Because of numerals International Law instruments the right of self determination is a subject of different interpretations and opinions. The declaration of independence in Kosovo from 17 February 2008 increases the scope of public International and solved some crucial questions. Kosovo has a balance of self-determination relationship with Sovereignty. The ICJ advisory opinion related to the Kosovo declaration of independence was rejected by many of the international communities. The court took the opinion from the case of the and stated that each case will be analysed and treated separately. As we can see that there are still conflicts going on in the Kosovo. These conflicts can be removed by usefulness and credibility of diplomacy as preferred tool. Let’s keep these things on the time as the time will only tell that court took core progressive that will lead to in contributing peace and stability. See. 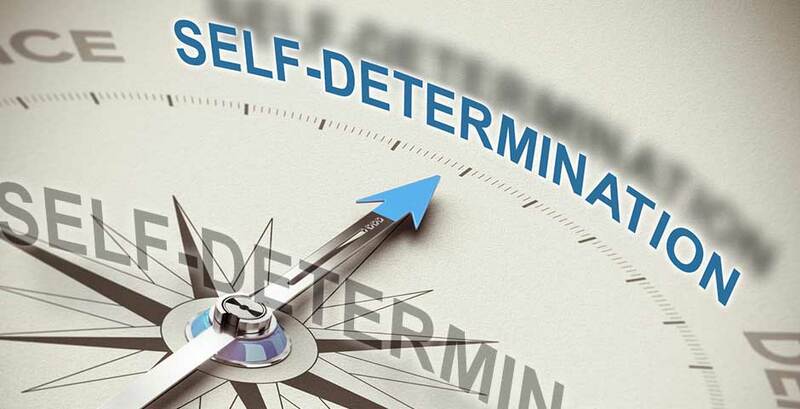 What Is Self-Determination? Using History to Understand International Relations, (2014), http://www.e-ir.info/2014/04/17/what-is-self-determination-using-history-to-understand-international-relations/ (last visited Mar 6, 2017). Clark & Ian, Legitimacy in International Society. Fundamental Legal Conceptions as Applied in Judicial Reasoning by Hohfeld, W.N. (1946). Claude, Inis. National Minorities an International Problem,. Cambridge: Harvard University Press, 1955. See. Daniel Thürer & Thomas Burri, Self-DeterminationOxford Public International Law (2008), http://opil.ouplaw.com/view/10.1093/law:epil/9780199231690/law-9780199231690-e873 (last visited Mar 7, 2017). Djokic, Dejan. Pasic & Trumbic : The Kingdom of Serbs, Croats and Slovenes. London: Haus, 2010. Hurst Hannum, ‘Rethinking Self-Determination’ (1993) 34 Va J Int’l L 1. On the evolution of the right to selfdetermination, see also Théodore Christakis, Le droit à l’autodétermination en dehors des situations de décolonisation (La Documentation Française 1999). Nowak, Manfred. UN Covenant on Civil and Political Rights : CCPR Commentary. Kehl [u.a. ]: Engel, 1993. The Editors of Encyclopædia Britannica, Self-determination Self-determination, https://www.britannica.com/topic/self-determination (last visited Mar 7, 2017). See. generally Quincy Wright, Mandates under the League of Nations (Chicago: Univ. of Chicago Press, 1930); R.N. Chowdhuri, International Mandates and Trusteeship Systems: A Comparative Study (The Hague: Martinus Nijhoff, 1955). 56 Congressional Record at 8671. See. Hurst Hannum, Legal Aspects of Self-Determination Legal Aspects of Self-Determination, https://pesd.princeton.edu/?q=node/254 (last visited Mar 8, 2017). Report of the International Committee of Jurists entrusted by the Council of the League of Nations with the task of giving an advisory opinion upon the legal aspects of the Aaland Islands question, League of Nations Off. J., Spec. Supp. No. 3 (Oct. 1920) at 5. The Aaland Islands Question, Report presented to the Council of the League by the Commission of Rapporteurs, League of Nations Doc. B.7.21/68/106 (1921) at 27. United Nations Charter, arts. 1(2), 55. Curiously, however, the French text of the Charter does refer to respect for the “right” of self-determination, the “principe de l’égalité de droits des peuples et leur droit à disposer d’eux-mêmes” (literally, the “principle of equality of the rights of peoples and their right to dispose of themselves”). UN G.A. Res. 1514 (14 Dec. 1960). Das Selbstbestimmungsrecht der Nationen by Decker, G. (1955). Salvatore Senese, External and Internal Self-Determination, https://www.jstor.org/stable/29766439?seq=1#page_scan_tab_contents (last visited Mar 9, 2017). Glanville, Luke. Sovereignty and the Responsibility to Protect: A New History, 2014. Algeria’s Struggle for Independence http://adst.org/2016/10/algerias-struggle-independence/ (last visited Mar 9, 2017). Pensions of officials of the Saar Territory (Germany, Governing Commission of the Saar Territory), http://legal.un.org/riaa/cases/vol_III/1553-1568.pdf. Koskenniemi, Martti. “National Self-Determination Today: Problems of Legal Theory and Practice.” The International and Comparative Law Quarterly 43, no. 2 (April 1, 1994): 241–69. doi:10.2307/761238. Richard F. Iglar, The Constitutional Crisis in Yugoslavia and the International Law of Self-Determination: Slovenia ’ s and Croatia ’s Right to Secede, 15 (1992), http://lawdigitalcommons.bc.edu/cgi/viewcontent.cgi?article=1537&context=iclr (last visited Mar 9, 2017). Stiks, Igor. “A Laboratory of Citizenship: Nations and Citizenship in the Former Yugoslavia and Its Successor States.” 2009. Reus-Smit, Christian. Individual Rights and the Making of the International System, Cambridge: Cambridge University Press 2013. Mag. Zoran Lutovac, The Right to Self-determination: The Collapse of the SFR of Yugoslavia and the Status of Kosovo, http://www.bundesheer.at/pdf_pool/publikationen/14_sr3_lutovac.pdf (last visited Mar 12, 2017). United Nations Interim Administration Mission in Kosovo. See. Linda Hamid & Jan Wouters, https://ghum.kuleuven.be/ggs/publications/working_papers/new_series/wp161-170/wp-166-hamid-and-wouters.pdf (last visited Mar 14, 2017). See. Christopher J. Borgen, Kosovo’s Declaration of Independence: Self-Determination, Secession and Recognition (2008), https://www.asil.org/insights/volume/12/issue/2/kosovos-declaration-independence-self-determination-secession-and#_edn1 (last visited Mar 15, 2017). See. Philpott, “Westphalia, Authority, and International Security” for a more detailed discussion of ‘absolute’ and ‘non-absolute’ versions ofsovereignty. Ioana Cismaș, ‘Secession in Theory and Practice: the Case of Kosovo and Beyond’ (2010) 2 Go J Int’l L 531, 548. Andrew Coleman, ‘Determining the Legitimacy of Claims for Self-Determination: A Role for the International Court of Justice and the Use of Preconditions’ (2010) 6 St Antony’s Int’l Rev 57, 58. The Cypriot Foreign Minister warned against the EU “breaking international law.” Harry de Quetteville and Bruno Waterfield, EU-US showdown with Russia over Kosovo, The Daily Telegraph Online (March 14, 2015) available at http://www.telegraph.co.uk/news/main.jhtml?xml=/news/2007/12/11/wkosovo111.xml. Nicholas Kulish and C.J. Chivers, Kosovo Is Recognized but Rebuked by Others, NY TIMES available at http://www.nytimes.com/2008/02/19/world/europe/19kosovo.html?pagewanted=2&hp. Thomas Franck, as quoted in SUZANNE LALONDE, DETERMINING BOUNDARIES IN A CONFLICTED WORLD: THE ROLE OF UIT POSSIDETIS 209 (2002) (emphasis in original). Reference re: Secession of Quebec, 2 S.C.R. 217 at para. 123 (1998). Dr. sc. Vesna Crnić-Grotić, redovita profesorica, THE RIGHT TO SELF–DETERMINATION – THE KOSOVO CASE BEFORE THE INTERNATIONAL COURT OF JUSTICE, 4. Degan, V.Đ., Međunarodno pravo, Pravni fakultet u Rijeci, Rijeka, 2000, p. 235. Countries that recognise Palestine vs. countries that recognise Kosovo. Why countries that recognize Palestinian statehood turn their backs on Kosovo, https://qz.com/365443/why-countries-that-recognize-palestinian-statehood-turn-their-backs-on-kosovo/ (last visited Mar 16, 2017). Gerry Simpson, Great Powers and Outlaw States: Unequal Sovereigns in the International Legal Order (Cambridge: Cambridge University Press, 2004), 352. Hurst Hannum, Autonomy. Sovereignty, and Self Determination: The Accommodation of Conflicting Rights, (Philadelphia: University of Pennsylvania Press, 1990), 19 (emphasis added). Kosovo Energy Corporation Daily Report, II. Available at: http://www.kekenergy.com/kek-cmnPg.jsp?mlD=203&cat=181 &1=2. “Chechen Rebels Satisfied with Kosovo Proclamation,” B9. Available at: http://www.b92.netieng/news/world-article.php?yyyy=2008&mm=02&dd=18&nav id=47806. In the meantime, Constitutional Court of Serbia accepted an initiative to review the legality of the agreement. Serbia and Kosovo sign historic agreement, at: http://www.guardian.co.uk/world/2013/ apr/30/serbia-kosovo-historic-agreement-brussels. Christopher J. Borgen, Is Kosovo a Precedent? Secession, Self-Determination and Conflict Resolution – See more at: https://www.wilsoncenter.org/publication/350-kosovo-precedent-secession-self-determination-and-conflict-resolution#sthash.NrvuHfr2.dpufIs Kosovo a Precedent? Secession, Self-Determination and Conflict Resolution – See more at: https://www.wilsoncenter.org/publication/350-kosovo-precedent-secession-self-determination-and-conflict-resolution#sthash.NrvuHfr2.dpuf (2011), https://www.wilsoncenter.org/publication/350-kosovo-precedent-secession-self-determination-and-conflict-resolution (last visited Mar 16, 2017). Mary Kate Schneider, Self-determination vs. sovereignty : examining the challenges of KosovoSelf-determination vs. sovereignty : examining the challenges of Kosovo, http://preserve.lehigh.edu/cgi/viewcontent.cgi?article=2007&context=etd (last visited Mar 16, 2017). NAŠA EVROPSKA BUDUĆNOST, TERRITORIAL INTEGRITY VS. SELF-DETERMINATION (SERBIA AND KOSOVO AS AN EXAMPLE) (2013), http://iea.rs/en/2015/02/03/territorial-integrity-vs-self-determination-serbia-and-kosovo-as-an-example/ (last visited Mar 16, 2017). Ali Abunimah, Kosovo and the question of PalestineKosovo and the question of Palestine (2008), https://electronicintifada.net/content/kosovo-and-question-palestine/7374 (last visited Mar 16, 2017).